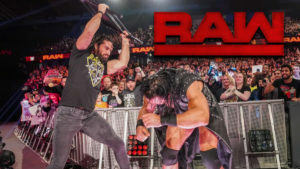 Bobby Lashley and Seth Rollins brawl, but Seth Rollins still wants Dean Ambrose. 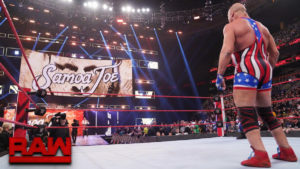 John Cena returns to RAW, but Drew McIntyre has been waiting for him. Alexa Bliss has a talk show, but it’s hijacked by Rousey, Banks, and Jax. The Revival want lumberjack justice, but they can’t seem to catch a break. Strowman wants a face to face with Lesnar, but Lesnar has other plans. Plus more! 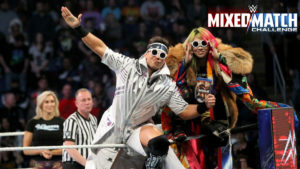 The final two teams of the Mixed Match Challenge are determined when Mahalica faces Apollo Crews and Bayley, and Fabulous Truth takes on Awe-Ska in the final weekly episode of season two. The playoffs start as the four remaining teams from RAW battle to determine who will go on to the semifinals of the Mixed Match Challenge. Two teams go home and the bottoms of both brackets face each other for a chance to move on into the playoffs. 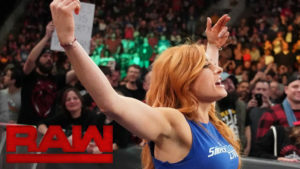 Charlotte Flair gets a new partner right before taking on Awe-Ska, and Monster Eclipse battles Country Dominance in a night of broken streaks. Mahalicia looks for their first win against the undefeated Monster Eclipse, and Ravishing Rusev Day makes a poor decision in challenging Fenomenal Flair to a chop-off.